One of the few moments when the press was allowed into the conference room to take photos was on July 28th to capture the ‘new’ Big Three at the start of the tenth plenary session. 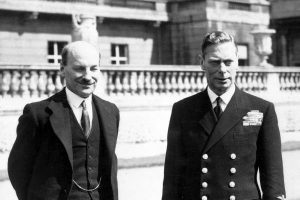 The British delegation had finally returned to Potsdam with new Prime Minister Clement Attlee and new Foreign Minister Ernest Bevin at the helm. Serving as Deputy Prime Minister under Churchill and anticipating a possible change in leadership, it should be noted that Attlee had been present for each plenary session since the Potsdam Conference began on July 17th. Before heading to Cecilienhof, Attlee made his way to the Little White House at 9:15 PM to personally reach out and have a private word with President Truman. In many ways Truman would see that Attlee was much different than his predecessor. Many within the American delegation found it hard to believe that the British people had elected this man to head His Majesty’s government at this critical moment in world history. 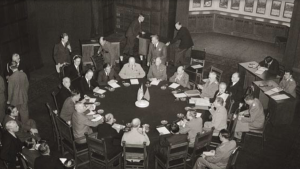 The British and American delegations made their way to the Cecilienhof Palace to meet the Soviet delegation for the tenth plenary session, which was called to order by President Truman at 10:30 PM. The ‘new’ Big Three sat down at the large round-oak table to resume business. Right away, Stalin asked to make a statement. His tone seemed to suggest that he was a bit disappointed in the Americans and British, but then he said nothing further on the subject. Maybe he thought he would put it aside for now and bring it up at a later date. It’s difficult to say. 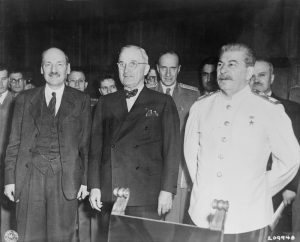 At any rate, Stalin had addressed the issue that President Truman knew would anger the Soviets, but now for the moment it was time to move onto a related topic. This sort of reaching out or “peace feeler” that Stalin had just communicated could only mean that the Japanese wanted to negotiate the terms of surrender – thus undoubtedly being in clear violation of the unconditional surrender demand. By issuing the Potsdam declaration on July 26th, the Americans, British and Chinese had given the enemy the opportunity to surrender. “I appreciate very much what the Marshal has said,” Truman responded. And then he moved to start with that evening’s agenda. In short, Truman didn’t have to negotiate or make any concessions with the Soviets regarding peace with Japan. He was sitting at the round-table in Cecilienhof with, as he would later say, “an ace in the hole and and ace showing.” That is to say, the ace in the hole was the atomic bomb and the ace showing was American economic and military power. Unconditional surrender was still on the table for the Japanese if they wished to accept it. Tonight’s agenda was mostly dominated by discussion on how Italy should pay war reparations. In short, right before the session adjourned just minutes before midnight, the Big Three agreed that heavy machinery and war equipment would be extracted as payment for peacetime production. Vyacheslav Molotov showed up at the Little White House for a one on one meeting with Jimmy Byrnes at 6:00 PM. Meanwhile, the British delegation still hadn’t returned from London so the tenth plenary session would be put on hold for another day. This gave Byrnes and Molotov a chance to negotiate one of the Conference’s most contentious issues: reparations and the future of Germany. The Soviet Union had shed more blood and suffered more death in WWII than any other nation by far, and the Soviets expected to get the lion’s share of reparations in return. This money was critical to the Soviet plan for postwar expansion and Molotov pressed Byrnes on agreeing to it. But Byrnes had to remind the Soviet Foreign Minister and explain to him in the simplest of terms that the $20 billion figure was set up at Yalta as a basis for discussion. But he didn’t. Byrnes’s analogy wasn’t sinking in; the Soviets wanted to get paid. Yet, Byrnes knew that the $20 billion just wasn’t practical. He explained to Molotov and reminded him that Germany was in shambles; hundreds of thousands were starving, and were in desperate need of food, water and shelter. And really the only way that Germany would be able to pay this would be through loans from the United States, which would likely never be paid back. History would therefore be repeating itself, as this was exactly the mistake that the United Sates made after WWI, and the American people would simply and surely not stand for it again. So Byrnes had to come up with something else – that is, “namely, that each country would obtain its reparations from its own zone (of occupation) and would exchange goods between the zones,” Byrnes said. It’s funny that Molotov would even bring this up, for there was already ample evidence that the Soviets had been looting territories that the Red Army had conquered – in especially Germany. In other words, the Soviets had already begun paying themselves at Germany’s expense. Yet, Byrnes was talking solely about reparations from each occupying power’s own zone, which hadn’t (wasn’t supposed to) even begun. Byrnes’s plan was an attempt to create a mechanism for a peaceful occupied Germany that would eventually reunify. He wanted to avoid future conflict between the United States and the Soviet Union, and thus diving Germany between east and west. Molotov, however, refused to let the $20 billion figure go and began to point fingers at the Americans that they were breaking the promise they had made at Yalta. The meeting ended where it had started, with no agreement. Already, the hope for a peaceful reunification of Germany was slipping away. 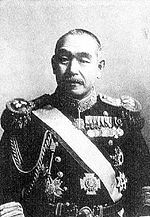 Meanwhile in Tokyo, Prime Minster Kantaro Suzuki and his cabinet had met during the morning to discuss the release of the Potsdam Declaration. Suzuki decided to simply ignore the matter. The declaration, he said at a press conference, was nothing but a rehash of old proposals and as such, beneath contempt. He would “kill (it) with silence,” he said. The Potsdam Declaration had clearly warned the Japanese of “prompt and utter destruction” if they did not accept it. It was rejected on July 27, 1945. With the British leaders back in London, there would be no negotiations or a plenary session held today. 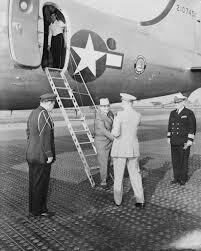 But President Truman got up early as usual and boarded a flight for Frankfurt. 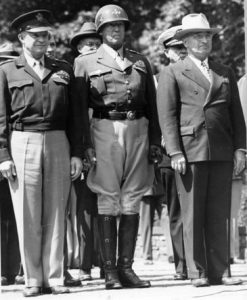 When he touched down at the U.S. Army airfield there, Supreme Allied Commander General Eisenhower greeted the President along with an honor guard from the 508th Parachute Infantry. Army units lined the roadways for over 30 straight miles and Truman rode past them in Eisenhower’s armored car with the general, inspecting the troops. The car steered deeper into the countryside, through quaint villages that had not been bombed. It was a reminder that not every single German had supported the Nazis, as there were plenty of Germans who had lived reluctantly through WWII and had lost so much – family members, businesses, and their overall every way of life. The group eventually ended up back at the Frankfurt headquarters where Eisenhower had organized the military government of the American Occupied Zone in Germany. The offices were housed in a building formerly owned by I.G. Farben, the giant chemical company that had supplied the poisons to gas millions of innocent victims in the Nazi death camps during the Holocaust. When Truman returned to the Little White House in Babelsberg around 7:00 PM that evening, he had learned that the people of Great Britain had elected Clement Attlee as their new prime minister. Several couldn’t believe it, but the Soviets seemed the most upset of all. According to Truman’s biographer, David McCullough, ‘How could this possibly be, Molotov kept demanding. How could they not have known the outcome in advance?’ Stalin postponed the Conference for another couple days and was seen by no one. 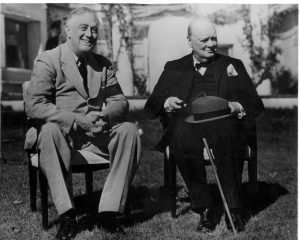 “First Roosevelt, now Churchill,” Truman noted privately. The old order was cleary passing. Finally, at 9:30 PM Berlin time, the President’s Press Secretary and personal friend, Charlie Ross, handed the a finalized version of the Potsdam Declaration to the press whose job it would now be to spread this document all the way to Tokyo. “We the President of the United States, the President of the National Government of the Republic of China, and the Prime Minister of Great Britain, representing the hundreds of millions of our countrymen, have conferred and agree that Japan shall be given an opportunity to end this war,” it began. Ross cabled his assistant back in Washington and informed him that President Truman’s wish was to get word to the Japanese people in every possible way. Soon, airplanes were flying over the mainland of Japan and dropping upwards of some 600,000 leaflets. The Potsdam Declaration would soon start to be read over the radio, and news of it appeared on the front pages of newspapers all over the globe in the morning. At the Little White House that evening, Truman tried to relax out on his lakefront porch. The President was exhausted and he knew that Stalin was going to be furious. The Generalissimo had never been consulted on the Potsdam Declaration before it had been released. But then again, the Soviet Union was not yet at war with Japan and thus had no authority to make any official demand. 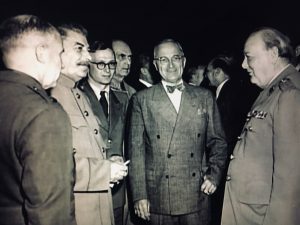 At the same time that the ultimatum was being released to the press, Truman had a special messenger walk the Potsdam Declaration up the street to Soviet Foreign Secretary Molotov. Even though the plenary sessions would still be suspended for another day, the President was certain that he’d be hearing from the Soviets the next morning. Something happened today that hadn’t happened since the Potsdam Conference began eight days ago: The Big Three sat down for today’s session before noon. Some have claimed over the years that the reason why most sessions began around 5:00 PM was because Churchill and Stalin couldn’t be bothered to get up before noon. 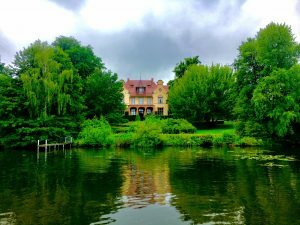 That might be partly true, but there was actually a lot going on behind the scenes in Cecilienhof before the Big Three met for their plenary sessions. 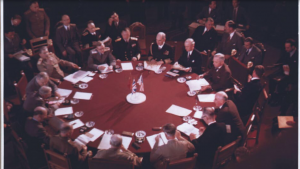 A typical day at the Potsdam Conference actually got underway around 8:00 AM with consultations in subcommittees, meetings among the joint Chiefs of Staffs, and then often followed by meetings involving the Foreign Ministers. Finally, the Big Three would come to (hopefully) make decisions on the agenda that had been put together based on what had been discussed or presented during the day. Today was different, however. At the end of this plenary meeting, Churchill and his political opponent, Clement Attlee, would be leaving Potsdam for London, where they would learn the results of the British national elections that had taken place nearly two weeks before the Potsdam Conference began on July 5th. Indeed, Churchill’s coalition government had successfully led Great Britain through the war, but the Labour Party’s decision to pull out of the national wartime government on May 23rd forced a general election to take place. 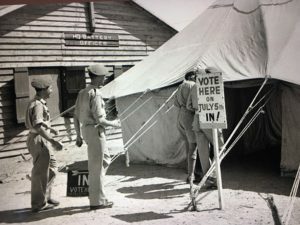 And on account of the participation of 1.2 million absentee ballots – primarily from soldiers stationed abroad – the outcome of the election could only be announced three weeks afterwards. President Truman called the ninth plenary session to order at 11:30 AM and once again, the Big Three would clash over Eastern Europe. Churchill: We must at some time discuss the question of the transfer of populations. There are a large number of Germans to be moved from Czechoslovakia. We must consider where they are to go. Stalin: The Czechs have already evicted them. Churchill: The two and a half million of them? Then there are the Germans from the new Poland. Will they go to the Russian zones? We don’t want them. There are large numbers still to come from Sudetenland. Stalin: So far as the Poles are concerned, the Poles have retained one and a half million Germans to help as laborers. As soon as the harvest is over, the Poles will evict them. The Poles do not ask us. They are doing what they like, just as the Czechs are. Churchill: That is the difficulty. The Poles are driving the Germans out of the Russian zone. That should not be done without considering its effect on the food supply and reparations. We are getting into a position where the Poles have food and coal, and we have the mass of the population thrown on us. Stalin: We must appreciate the position of the Poles. The Poles are taking revenge for centuries of injuries. Churchill: That consists in throwing them on us, and the United States? 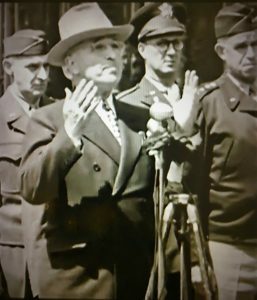 Truman: We don’t want to pay for Polish revenge. If Poland is to have an occupation zone, that should be clearly defined, but at the present time there are only four zones of occupation. If the Poles have an occupation zone they should be responsible for it. The boundary cannot be fixed before the peace conference. I want to be helpful, but Germany is occupied by four powers, and the boundary cannot be changed now; only at the peace conference. If the conference ends in ten days without agreement on the present state of affairs in Poland, and with the Poles practically admitted as a fifth occupation power, and no arrangement for the spreading of food over the whole of Germany, it will mark the breakdown of the conference. I suppose we will have to fall back on our own zones…I do hope that we will reach a broad agreement, but we must recognize that we have made no progress so far on this point. Now Churchill was leaving, and nothing major had been accomplished at Potsdam. “I hope to be back,” Churchill replied. Early this morning, Secretary of War Stimson made his way to President Truman’s office in the Little White House. He informed the President that a warning message to Japan was nearly ready. This document would be known as the Potsdam Declaration, a final ultimatum to force Japan to accept the unconditional surrender demand. Unconditional surrender was a term introduced by Roosevelt at the Casablanca Conference in January 1943 and reconfirmed at the Cairo Conference later that same year. It meant that war would continue until both Nazi Germany and the Japanese Empire accepted this demand. Germany already had, but Japan hadn’t. By this point in the war, Japan had been defeated. In theory, it had been defeated well before Truman became President. In fact, studies by the Japanese themselves had determined that their war had been lost by January 1944. Yet, Japan’s defeat was not the issue. It was their accepting the unconditional surrender demand that was so desperately wanted. In particular, unconditional surrender would mean that Japan would have to do away with its Emperor, the heavenly symbol of the Japanese people. 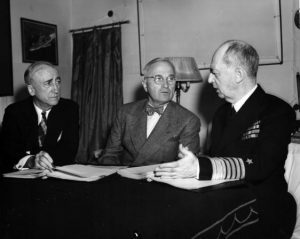 Truman had been informed by a number of his advisers, including Secretary of War Stimson, that the unconditional surrender demand would make it more difficult to achieve peace. He was therefore advised on a number of occasions to add an explicit provision that would allow the Japanese to keep their Emperor. Although Truman listened carefully to this advice, Stimson and others failed to convince him to do so. 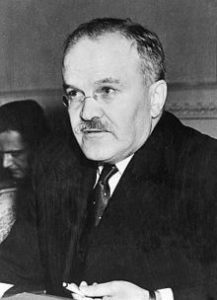 Secretary of State Jimmy Byrnes, who had been a part of Roosevelt’s inner circle at the start of the war and especially in 1943 when unconditional surrender was introduced – vehemently opposed any such change to the demand. He believed that unconditional surrender was an objective too long established, too often proclaimed; it had been, as Truman’s biographer David McCullough would write, “too great a rallying cry from the time of Pearl Harbor to abandon now, Byrnes insisted.” It was what the Nazis had been made to accept, and its renunciation with the Japanese at this late date, after so much bloodshed, the acceptance of anything less with victory so near, would seem like appeasement. Especially if you consider American opinion at this time. A Gallup Poll in June 1945 had shown that a mere fraction of Americans, only 7%, thought the Japanese Emperor should be retained after the war, even as a puppet, while a full third of the people thought he should be executed as a war criminal. However, for every day that Japan rejected the unconditional surrender demand, fighting would continue and the loss of lives in the Pacific Theater would continue to climb. Meanwhile, at Cecilienhof, the seventh plenary session was called to order at 5:10 PM. Although there was talk about accessing and administering the Rhine and Danube rivers, along with Allied policy in the Middle East, the biggest topic of this session was Königsberg, a piece of German territory that the Soviets were demanding. This was not only an ice-free port to the Baltic, but it was also a historically symbolic piece of Germany. Initially inherited in the early 17th century as Duchy by the House of Hohenzollern (the eventual ruling dynasty of the Prussian Kingdom and German Empire), it was here that Elector Friedrich III of Brandenburg, crowned himself King Friedrich I in Prussia in 1701. Soon officially seated in Berlin and Potsdam, the Kingdom of Prussia would go on to play a pivotal role in shaping the politics and history of central Europe for over the next two centuries. Stalin: This was brought up at Yalta. We stated it was necessary to have at least one ice-free port at the expense of Germany. 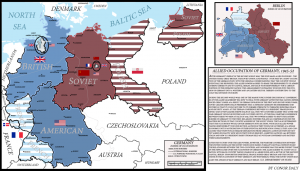 Too much blood has been spilled by the Soviet Union not to have some piece of German territory. Neither the President nor the Prime Minister raised any objection at Yalta, so the question was agreed upon. We are anxious to have that agreement confirmed at this conference. Churchill replied that the British government sympathized with the Russian desires, and Truman didn’t have any objection in principle. After today’s session was adjourned, it was now the Prime Minister’s turn to host that evening’s dinner party and he had already promised that he’d “get even” with the Soviets and Americans. Churchill had invited the entire British Royal Air Force Orchestra to play that evening while the Big Three indulged in copious amounts of delicacies and drinks. Amusingly, Stalin arrived at Churchill’s dinner party in a bulletproof limousine with some fifty armed guards, while Truman showed up on foot with Byrnes, Leahy, and three secret service men. Last night at Stalin’s party, Churchill, who cared little for music, told Truman he was bored to tears and wanted to head home early. 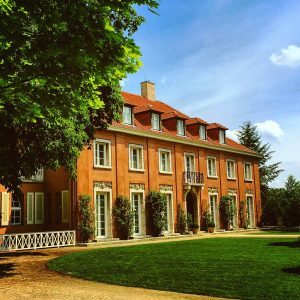 Truman, who – as it was written in yesterday’s blog – was having the best time he’d have during his entire trip to Potsdam, told the Prime Minister that he’d planned to stay until the party was over. So, Churchill begrudgingly changed his mind and slowly made his way over to a corner for another half hour or so. 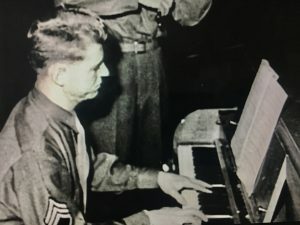 Until the music ended, he “glowered, growled, and grumbled,” as Truman would amusingly describe it. Things would be much different today. Just after midday, Secretary of War Stimson made his way to Churchill’s Villa to read Grooves report which had gotten Truman “all pepped up” just before yesterday’s session. The sixth plenary session was called to order at 5:10 PM. Although the question of what to do with Italy’s colonies was briefly discussed – which was eventually deferred to the Council of Foreign Ministers to include as part of their drafting of the Peace Treaty – the largest issue on the agenda today was once again Poland. Polish Administration Area – highlighted in yellow – was the biggest topic of contention on this day. If you remember from yesterday’s blog, Stalin had informed Truman and Churchill that a (Soviet supported) Polish Administered Area had been established from the Oder River at the start of the western front stretching to Germany’s 1937 borders in the east. Furthermore, Stalin also claimed that all the ethnic Germans in this area had left after President Truman had inquired about the “nine million” of them spread throughout this territory. 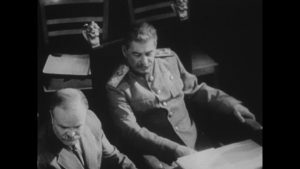 Stalin then reintroduced his suggestion that representatives from the Polish Administered Area be invited to Potsdam to give their viewpoints on the current situation in their de facto zone. Churchill withdrew his initial objection and agreed. Truman also agreed. In conclusion: Today’s session revealed some of the largest frustrations that Churchill and Truman must’ve felt when it came to the Polish question at Potsdam. At the end of the day, both the President and Prime Minister wanted free and fair elections to play out in Poland, but the Soviet Army was occupying large parts of Eastern Europe (including Poland) and assisting in the establishment of new governments that would be sympathetic to the Soviet Union. Moreover, the Soviet goal was to essentially use these countries of Eastern Europe as a belt of protection against any future foreign invader. 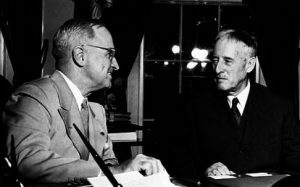 At 3:30 PM, Secretary of War Henry Stimson arrived at the Little White House with a full description of the test of the atomic bomb that had taken place five days earlier on July 16th. 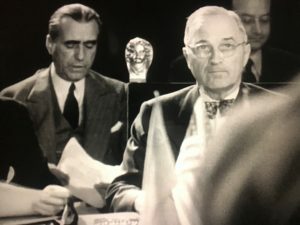 It was sent to Potsdam by General Leslie Grooves who was overseeing the Manhattan Project back in the U.S. and regularly updating Stimson while he was away at the Conference with the President. 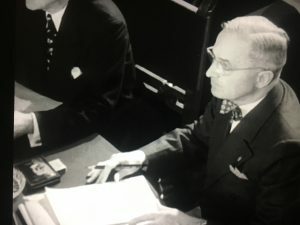 Behind closed doors in Truman’s villa, Stimson read Groove’s document aloud to the President and Secretary of State Jimmy Byrnes. It took some time, as it was fourteen pages double-spaced. At 530, 16 July 1945, in a remote section of the Alamogordo Air Base, New Mexico, the first full scale test was made of the implosion type atomic fission bomb. For the first time in history there was a nuclear explosion. The test was successful beyond the most optimistic expectations of anyone. Based on the data which it has been possible to work up to date, I estimate the energy generated to be in excess of the equivalent of 15,000 to 20,000 tons of TNT. Grooves description would go onto note that windows were shattered by the blast as far off as 125 miles from ground zero. The 60 foot high steel tower, from which the bomb fell, immediately evaporated. It left a crater in the New Mexico desert more than two miles wide. It knocked down men more than 10,000 yards away and the mushroom cloud, containing a huge concentration of radioactive material, could be seen for more than 200 miles away. Truman went straight to Cecilienhof after the meeting where the 5th plenary session was called to order at 5:05 PM. According to Truman’s biographer, David McCullough: The change in him was pronounced. He was surer of himself, more assertive. It was apparent something had happened. 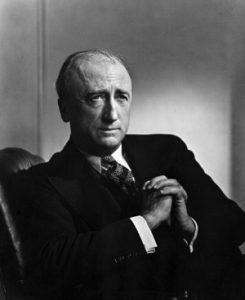 Churchill later told Stimson he could not imagine what had come over the President (Stimson went to see the Prime Minister the next day to read him Groove’s report). Vice President for just 82 days and President of the United States for just over three months, it is hard to imagine that the farmer/failed haberdasher from Missouri was now anything less than fortified as he now sat in the presence of two of the most colossal figures of modern history, negotiating the postwar world. 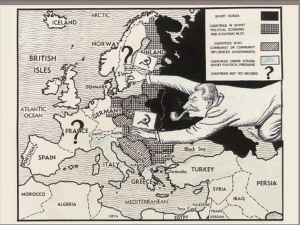 At one point during this evening’s session, Stalin said that the three governments should issue a statement announcing a renewal of diplomatic relations with the former German satellite nations of Romania, Bulgaria, and Finland. When Truman disagreed, Stalin said the questions would have to be postponed. “We will not recognize these governments until they are set up on a satisfactory basis,” Truman replied aggressively. Yet, the biggest and thorniest question of the Conference was Poland, which dominated much of this session. 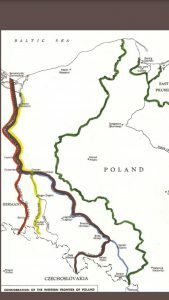 Immediately to the east of the Soviet zone is the new Soviet backed, Polish Administrative Area, which stretches east to the 1937 German border. After the war, millions of ethnic Germans were driven out of this area (Truman asked about the “nine million” on this day, but historians agree that there could’ve been upwards of 10-12 million Germans affected). In vague language at Yalta it had been agreed that Poland would get territory from Germany to the west to compensate what Russia had taken from Poland in the east. At the moment, however, the Red Army was occupying all of Polish territory from Germany’s 1937 border (border with Russia) all the way up to the Soviet zone of occupation in Germany. Furthermore, a Soviet backed, Polish Administrative Area had already been established to run the area. Truman: The question is not who occupies the country, but how we stand on the question as to who is to occupy Germany. I want it understood that the Soviet [Union] is occupying this zone and is responsible for it. I don’t think we are far apart on our conclusions. Stalin: On paper it is formerly German territory but in fact it is Polish territory. There are no Germans left. The Soviet [Union] is responsible for the territory. 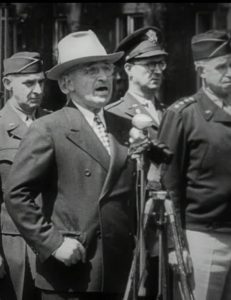 Truman: Where are the nine million Germans? Churchill: How can they be fed? I am told that under the Polish plan put forward by the Soviets that a quarter of arable land of Germany would be alienated—one-fourth of all the arable land from which German food and reparations must come. The Poles come from the East but 8¼ [8½?] million Germans are misplaced [displaced]. It is apparent that a disproportionate part of the population will be cast on the rest of Germany with its food supplies alienated. Truman: I propose that the matters of the Polish frontier be considered at the peace conference after consultation with the Polish government of national unity. 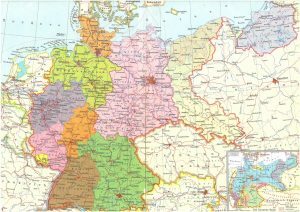 We decided that Germany with 1937 boundaries should be considered starting point. We decided on our zones. We moved our troops to the zones assigned to us. Now another occupying government has been assigned a zone without consultation with us. We can not arrive at reparations and other problems of Germany if Germany is divided up before the peace conference. I am very friendly to Poland and sympathetic with what Russia proposes regarding the western frontier, but I do not want to do it that way. In other words, the Russians could not arbitrarily dictate how things were to be, and there would be no progress on reparations or other matters concerning Germany until this was understood. Again, the Big Three tabled the question of Poland for further discussion and adjourned. Truman had showed an unexpected amount of energy and confidence during this session. Churchill was pleased and his Foreign Secretary, Anthony Eden, thought it was Truman’s best day so far. Even Leahy, the President’s Chief of Staff, was impressed, though he was certain – bomb or no bomb – that Stalin had no intention of changing his course in Eastern Europe. He regarded Poland as a “Soviet fait accompli” and since millions of Soviet soldiers occupied the territory to the east, there was little the United States and Great Britain could do about it, short of going to war. This of course was unthinkable. Finally, it was now Stalin’s turn to host the American and British Delegations for an evening party at his villa. Here, there was no trace of the heated tension from just a couple of hours ago. Stalin wanted to outdo the Americans in a contest of decadence. It’s safe to say that he succeeded as this evening would end up being the best time the President would have during his entire 19 days at Potsdam. Late in the morning, Generals Dwight Eisenhower and Omar Bradley made their way to the Little White House to meet with President Truman. 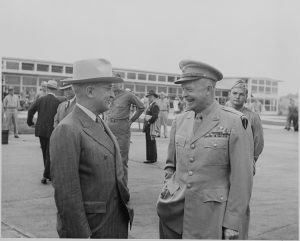 They spoke about strategy in the Pacific and the use of the atomic bomb, on which the generals were brought up to speed. Even though Truman didn’t specifically ask the generals for their opinions, Eisenhower said he opposed the use of the bomb, thinking that Japan was already defeated. He’d even expressed to Secretary of War Stimson the hope that the United States would not be the first to deploy the most terrible weapon in the world. Some years later, though, Eisenhower would concede that his reaction was personal and based on no analysis of the subject. The scene was a tragic contrast from the dinner party the night before. The President and the two Generals arrived in the American sector at the US Group Control Council Headquarters for a flag raising ceremony. The Stars and Stripes raised that day was the same flag flying over the White House when Japan attacked Pearl Harbor and on the day the United States declared war on Nazi Germany in 1941 (it would be raised over Rome and Paris when those two cites were liberated as well). Unhooking his thumbs from the side pockets of his double-breasted suit, he freed his hands and chopped the air in unison as he then said, “We want peace and prosperity for the world as a whole,” as he stressed each word with emotion. Following the ceremony up in Berlin, the fourth plenary session of the Potsdam Conference was called to order at 4:10 PM. Today the Council of Foreign Ministers and the subject of the treatment of Italy would dominate this brief session. In short, Churchill wanted the Council to meet in London – to which Truman and Stalin supported – and the Big Three began discussing the terms of a peace treaty for Italy. President Truman called the third plenary session to order at 4:05 PM. The biggest issues confronting the Big 3 today, on which everyone had his own viewpoint, was what to do with Franco’s government in Spain and what should now happen in Yugoslavia. In short, Stalin wanted Franco out, while Truman wanted nothing to do with it. Both Truman and Churchill wanted free elections in Yugoslavia while Stalin supported Tito’s dictatorship. Conflict was waiting to erupt. Churchill responded with some dubious reference to the Yalta Conference, while Stalin would not surrender or relinquish his support for Tito. Utterly annoyed and completely exhausted, Truman finally yielded to the stalemate and called the third session to an end. Only 3 of 17 days into the Conference and it was already clear that the wartime spirit of cooperation was fading dramatically fast. 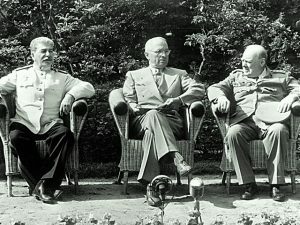 What’s interesting to understand about the Potsdam Conference by this point is that the Big Three began facing their differences for the first time. During their previous meetings at Tehran and Yalta, which took place while they were still relying on each other to defeat Nazi Germany and liberate Hitler’s Europe, they had been able to make grand statements about the future of Germany and Europe while postponing or delegating issues on which they disagreed. Now at Potsdam, that was no longer necessary or possible. Disagreements could no longer be concealed. 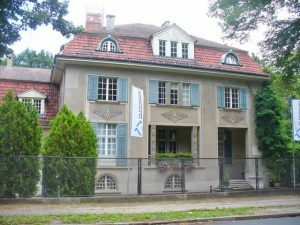 Despite their differences in the afternoon, it was now President Truman’s turn to host Churchill and Stalin at “The Little White House” at Kaiserstraße 2 (today Karl-Marx-Straße). 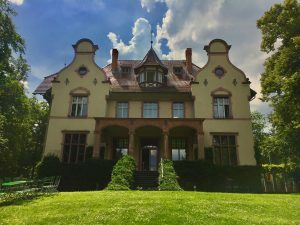 In his villa beautifully situated above Griebnitzsee, he threw a party that night and flew in two American GIs to entertain, a concert pianist and a professional violinist. Dinner that night had to have been one of the most elaborate served in Europe in years: pate de foie gras, caviar on toast, cream of tomato soup, olives, perch saute meuniere, filet mignon, mushroom gravy, shoestring potatoes, peas and carrots, tomato salad with French dressing, Roca cheese, and vanilla ice cream with chocolate sauce which had been flown in from the USS Augusta in Antwerp (Truman’s transportation across the Atlantic). The wines included a chilled German white called Niersteiner from 1937; a fine Bordeaux, Mouton d’ Armailhac; Champagne, 1934 Pommery; plus coffee, cigars, cigarettes, port, cognac, and vodka. Churchill even toasted to his political opponent, Clement Attlee, sitting quietly across the table: “I raise my glass to the leader of His Majesty’s loyal opposition.” Churchill’s icy sarcasm was not lost on Attlee, who had thus far said very little at Potsdam. Finally, even Secretary of State Jimmy Byrnes was in unusually good form. “His stories were good, and told with both Irish and southern charm,” remarked one ambassador present. Meanwhile, Admiral Leahy got his chops busted from the others for his abstinence from alcohol. Food, music and booze had come to save the day. The cold conspicuous glares of rigorous diplomacy in Cecilienhof during the day gave way to many genuine smiles at night. An avid early riser his whole life, President Truman sat down at his desk bright and early on July 18th and composed a letter to his beloved wife, Bess. Shortly after 1:00 PM and being accompanied by half dozen officials, President Truman walked down to Ringstraße 23 (today Virchowstraße) to Churchill’s villa to have lunch with the British Prime Minister. The President showed the Prime Minister two telegrams that had arrived from Washington the night before confirming that the Atomic Bomb was ready. They both agreed that Stalin ought to be informed, but weren’t quite sure exactly how to do it. Should he be written a letter? Or just simply told? 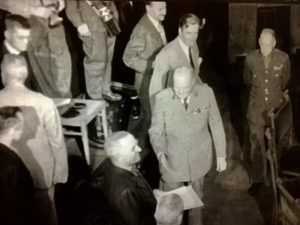 At any rate, Churchill believed that the Generalissimo should be told sooner rather than later, and Truman decided that the best time would be to just simply wait for the right moment during one of the forthcoming sessions. Truman then made his way to Kaiserstraße 27 (today Karl-Marx-Straße) to pay a return visit to Stalin with his Secretary of State, Jimmy Byrnes, and his interpreter, Chip Bohlen. The three men were taken by surprise when they walked into Stalin’s villa and saw a second lunch waiting for them. Again, the Soviets painstakingly over-did themselves by preparing an elaborate meal in President Truman’s honor. The second plenary session was called to order at 4:20 PM that afternoon. 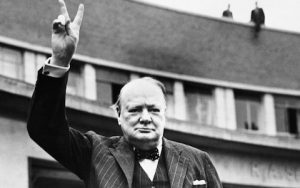 Many observers agreed that Churchill didn’t seem himself. He was tired, cranky and distracted by the current election count which could end his term of office in a matter of a few days (Great Britain had held national elections on July 5th). 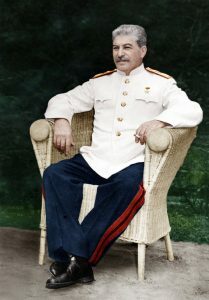 Stalin, on the other hand was concise, friendly and very protective of his interests. “We cannot get away from the results of the war,” said Stalin. The formal business was to be Germany and Truman suggested they begin at once. Churchill spoke up and insisted that the delegations agree on defining what was meant by Germany. 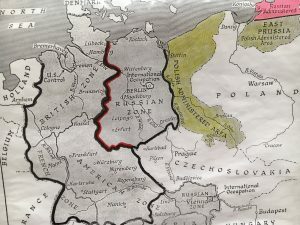 If they were to define Germany before WWII, then he was ready to discuss – his point being that the Germany of the moment was one with eastern boundaries being determined by the position of the Soviet Red Army. So it was agreed by the Big Three that the ‘Germany of 1937 should be the starting point’, bringing a shed of light to the delegations that a major step forward had been taken. Finally, they turned to the question of Poland and began talks about its postwar future. After the first plenary session, Churchill’s Foreign Secretary, Anthony Eden, had written about his disappointing observation of Churchill: “The P.M. was wooly and verbose..” Again, on day two, Churchill entered into another narrative as he talked about the future of Poland, a subject that moved him immensely. It made him talk even longer than usual, and so went the remainder of the session. Tomorrow, President Truman would reach his boiling point.